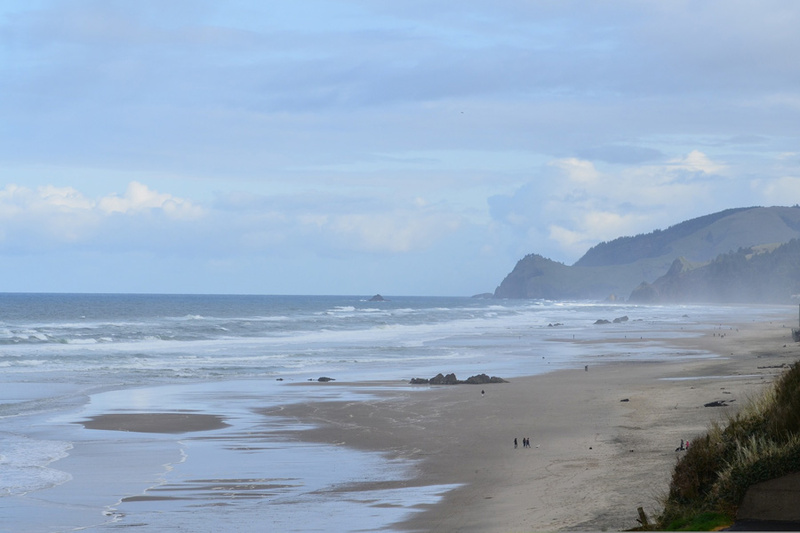 Lincoln City has a large stretch of sandy beach that runs along town, which offers many great beach activities. The main part of the beach, near the center of town, is usually fairly busy on the weekends and in the summer, but if you go to some of the smaller out of the way entrances or you hike down the beach a bit, you can find spots that are not very crowded. Lincoln City is a popular vacation and weekend getaway spot for people from Portland so there are many people that just drive down for the weekend and go back to the Portland area on Sunday afternoon. The weekends are typically more crowded and it is harder to find hotel rooms. If you go to Lincoln City on the weekdays it is less crowded and most of the hotels have lower rates and mid-week specials. There are several hotels with direct beach access or a short walk to the beach. If you look around a bit you can find some good deals on rooms with ocean view especially on the week days and during the off seasons. The weather is cool most of the year with temperatures rarely above the 70s even in the middle of the summer so bring a jacket. The water is cold in this part of the coast and you will probably want a wet suit if you plan on doing any swimming or playing in the water. Kite flying is popular as Lincoln City is hailed as one of the best cities in the world for kite-flying, and there are in fact, three kite festivals held each year. There is usually a decent ocean breeze that is enough to fly a kite, but not too gusty, making it a nice place for kites. On the south side of town at Depoe Bay there is good whale watching. All year round, gray whales can be seen here. There is a whale watching center that is free to the public and has observation decks with great views of popular whale spots along with informative displays and rangers that will tell you about the whales and answer questions. There are also private companies that have guide boats providing trips out in the water that can get you a little closer to the whales. Lincoln City is a nice place to vacation because it is not too overly developed and has some nice places nearby where a person can relax away from the crowds and enjoy some peace and quite. If you look around, you can find some good deals on dining and hotels. There are also many good camping, hiking, and great outdoor places within a short drive of Lincoln City making Lincoln City a good place to stock up on supplies and maybe a hotel room with a hot shower before your next outdoor adventure.